The Casa dei Girasoli is an old stone farmhouse, built in 1700 on the pre-existing watchtower, dating back to 1200. The total renovation of the entire complex in every detail, has kept unchanged the original features in typical Tuscan style, such as vaulted ceilings, original exposed wooden beams, brick arches, terracotta floors, without giving up all modern comforts. The result is an ideal mix of tradition and innovation, a perfect combination of simplicity and comfort. 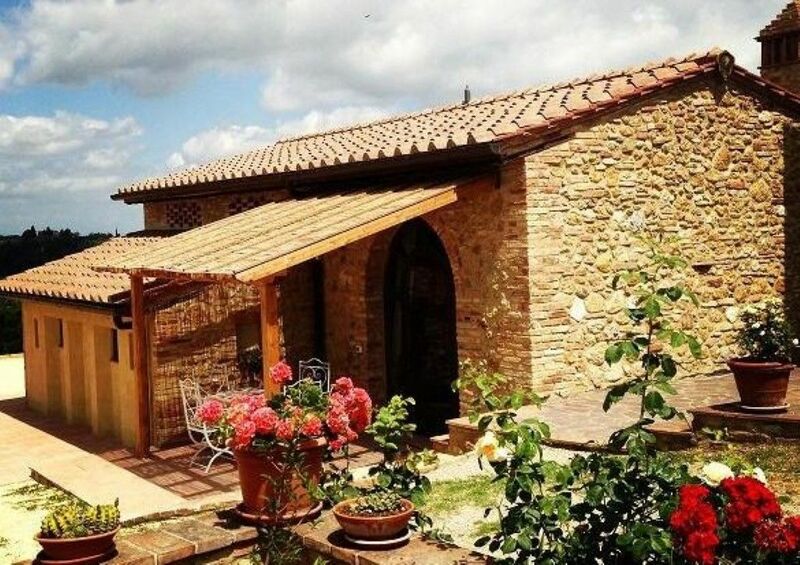 It is a family-run farmhouse, surrounded by greenery, which offers its guests excellent value for money; distinguishes itself for the careful cleaning of the apartments, the wonderful 360 ° panoramic position on the hills of the Sienese Chianti, the particular attention to the environmental protection and the proximity to San Gimignano (1 km) and to the main places of tourist and cultural interest of Tuscany, like Siena (35 km), Florence (45 km), Pisa (75 km), Lucca (80 km), Volterra (30 km) and Certaldo (10 km). The historic center of San Gimignano, the famous medieval city with the "Belle Torri", UNESCO world heritage, cultural and natural heritage, is only 1 km from the Casa dei Girasoli and can be easily reached on foot with a suggestive panoramic walk of 15 minutes. The CASA, which bears the name of "GIRASOLI", symbol of summer, is part of an agricultural and wooded farm of 10 hectares with olive groves and rows of vines, dotted with cypresses and surrounded by green wheat fields interrupted by the light of the sunflowers, which will allow you to return to the genuine, true and hospitable dimension of traditional country life. More than as a customer you will be welcomed as true guests and we will do everything to make you feel at home and guarantee maximum comfort. Upon your arrival, we will provide maps, guides and useful tips on the nearby cities of art and the most beautiful places to visit, as well as information on festivals, festivals, markets, events and local restaurants, some of which are affiliated with us. We will always be at your disposal for every need, while privileging discretion, to leave all the freedom you want to enjoy. We are convinced that, like all our guests, you will also be enthusiastic about the beauty of the Casa dei Girasoli. We are waiting for you in this haven of peace, to spend an unforgettable holiday and relive the past history and traditions.